The Manor of Bedgebury was first mentioned in a deed of Coenwulf, the Anglo-Saxon king of Mercia, in AD 814: Bedgebury as a name being derived from the Old English for “pasture by the bend”. Six generations of the Norman family de Bedgebury lived on the former hunting estate in the original 13th century house, which stood where the Great Lake is now. In 1450, the manor was acquired by the Culpepper family, who held it for more than 250 years through seven generations, including Thomas Culpepper who was executed for adultery with Catherine Howard, Henry VIII’s fifth wife. In August 1573, Alexander Culpepper and his wife Ann entertained Queen Elizabeth I at the manor. 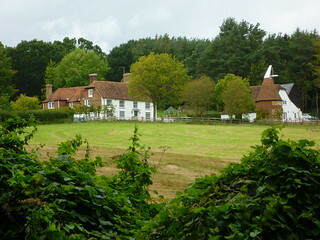 A few days later, Elizabeth knighted Alexander at nearby Rye. Sir Alexander encouraged the establishment of iron furnaces and foundries on his estate, where guns were cast for the fleet of English ships that defeated the Spanish Armada. The Culpepper family was eventually broken up by the Civil War, and the 2,300-acre estate was sold to Sir Thomas Hayes in 1660. The present house was built in 1680 by Sir James Hayes. In 1836, it was taken over by Viscount Beresford, the Duke of Wellington’s Field. 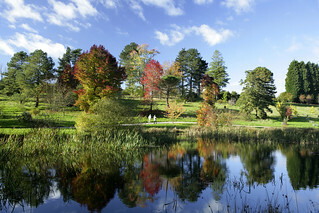 The walk passes through Bedgebury forest which is a beautiful place to visit any time of the year. It is also home to several cycle trails and activities for younger visitors including the Gruffalo trail. There is also a full programme of events and a cafe there. 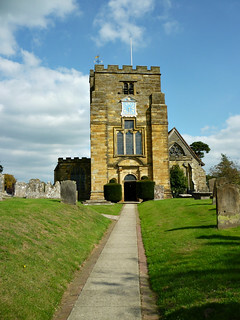 From the Weald Information Centre just below St Dunstan's Church, head up the High Street and turn left after the Post Office. Go past the public conveniences and over the Crane stream. Continue straight along Brookside, bearing right into Bramley Drive, then right again into Freight Lane. Follow this lane down the hill and past The Freight house on your left. Walk straight on and over the fields until you reach the edge of a large field, where the footpath divides. Bear right across the field (you may find it easier to follow the edge of the field if it is cultivated), until you reach the Swattenden Lane. Go straight over the stile, following the footpath south, and past the buildings of the Swattenden Centre. A Victorian house, used in the 1950s and 60s as a boys' secondary modern school, the centre now offers short residential educational courses. 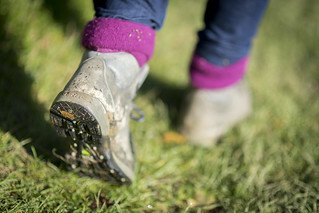 Follow the footpath across the fields until you reach a thin section of woodland. Go over the bridge and the stile on the far side, and into a field. Follow the left edge of the field until you see a signpost directing you left through a shaw, and towards a gate in the top left corner of the field. On the other side of the gate, head straight across the field towards another shaw and two stiles. Emerging from the woodland, follow the footpath across the fields, and you will notice the rocky sandstone outcrop on your right as you walk up the slight incline towards Water Lane. As you come out onto Water Lane, turn left, then right, at Four Wents, and carry on down Potters Lane. Pass the farm buildings on your right, and take the footpath on the right where the road bends. Follow the path up the hill and round the edge of a field, walking towards a gap in a line of trees. The footpath leads straight up through the middle of a large field, reaching a track at the top which you follow until you reach Water Lane at Tubslake, on one of the ancient drove roads. Turn left and follow the lane until you reach the A229, Hawkhurst Road. Cross the road with care and turn left, then right, into Park Lane. Walk across the disused railway line at Badger's Oak. Follow the lane into Bedgebury Forest, and carry on until you reach Louisa Lodge - now a row of cottages. If you want to take a short cut which does not visit the Pinetum, continue past the cottages, and follow the bridleway past Sugarloaf Hill. Go up the incline to a quarry on the top of the ridge. Keep following the bridleway to Furnace Farm, and turn right on to the trackway, and go past the old oast houses. The track follows the route of the ancient sunken lane, and eventually arrives at Hartley and the A229. To visit the Pinetum, take the left track at Louisa Lodge, then go down the first bridleway on the left, towards Frith Wood. Follow the track and bear right at marker 32, following the blue cycle route around the forest. At the bottom of the hill turn left and carry on towards the visitor centre and play area. Continuing to the top of the hill, turn right and enter the Pinetum through the gate, and follow the path that leads down to the visitor centre. Heading back towards Cranbrook from the visitor centre, follow the Pinetum Trail towards Marshal's Lake, and walk over the bridge. Go straight on up the steps, and bear right towards the public conveniences. Make your way through the gate and right onto the track, past the Forestry Commission offices on your left. Continue up the track until it forks, and take the left fork leading past Brick Kiln Cottages. Follow the track up the hill, taking the left turn at Iron Latch, and carry on along the footpath to the small quarry at the top. Take the right-hand bridleway towards Furnace Farm, passing Three Chimneys Bank on your left. Cross the road, and follow the A229 back to Cranbrook, admiring the buildings on either side of the High Street as you return to your starting point. This 10 mile route takes the walker northwards from Cranbrook through woods, past ancient houses and mills and over the rolling wealden landscape to Sissinghurst Castle.